happy valentine day to you too dear.. Happy Valentine's Day Brenda! Love reading your posts! What a great Valentine's story! Happy V'Day to you and your DH!! As a southern girl, I've heard Honey Bun, Honey Bunch, and Sweetie Pie, but not Honey Pie! That makes you uniquely special! Happy Valentine's day to you! By the way, I think the larger hearts are better too! Did you know that there is a song called 'Honey Pie' by the Beatles? That's indeed a special heart that you found in the bowl. Awe, that is so sweet! Blessings sent to you and you DH!! Now that you believe in Honey Pie, how about thinking of Love Allways as meaning love in all ways - happy or sad, good times or bad - you get the picture, and it's looking pretty love filled to me! frequently to my husband and son. I loved this post Brenda! What a great story! 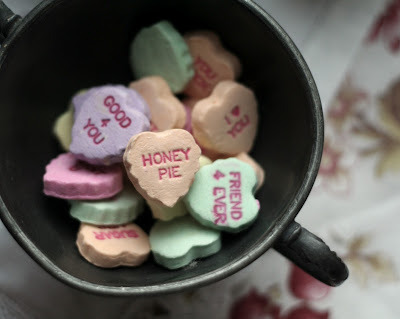 Honey Pie is a lovely term of endearment. My DH is a little corny and old fashioned and he always calls me his beloved, pronouncing it with the three syllables be-luv-ed. It's a little different but I wouldn't have it any other way. What a lovely story, and a lovely tradition, Brenda. That's awesome! I'm glad you have a honey to be happy with! I got a couple of phone calls from friends, and I had a lovely day too. (The finish helped, lol.) Have a great one! I love honey-pie! I've used that occassionaly but generally, my term of endearment is "sugar". Of course, I am a southerner by birth!